Here’s a portion of an amazing Basketmaker petroglyph panel located along the San Juan River near Butler Wash and known as the Shamans Panel. 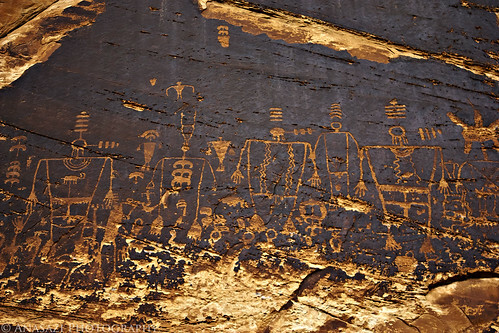 Currently, this is probably the best portion of the panel, however, if you walk along the cliff face you will find hundreds, if not thousands, of other petroglyphs in this same area. Unfortunately, a lot of the other petroglyphs are very faint and hard to see and photograph. This area must have been very important in the past.